I love to decorate my mantle for the holidays but I didn't really have anything for February/Valentines, so this year I finally pulled something together. I only spent $17 total, the one thing I bought were these cool vintage highway metal letters spelling LOVE from this Etsy shop. Scrabble tiles were from our game, this could be cute for many different holidays. The rest of the items I had. I did make the LOVE print in the frame, I had the frame and worked up the print. I also made the heart garland, it's just cut out hearts stitched together on the sewing machine. The white paper flowers I made years ago, usually they are in my china cabinet. Check back on Feb 1st, I'll have the LOVE print up so you can download it for FREE! Believe it or not this is a photo of the same dog. 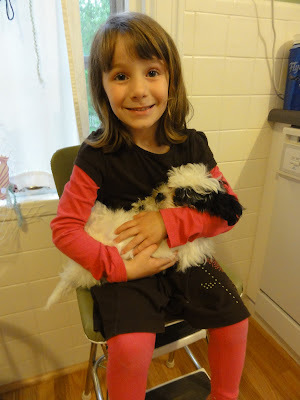 Under all that soft, fluffy fur is one tiny little dog. Last spring we got a new puppy and named him Groucho because of his little mustache. Today he turns one year old and we can't imagine not having him with us. Yes, puppy hood was hard work and he still is not perfect. He loves to chewy on polly pockets and for some reason likes to pee in the girls room, ughhhh. We finally put the baby gate up in the girls doorway to keep him out of their room. Other than that he is such a sweet dog, he loves to cuddle in your lap. Sometimes so much so I think I had a third baby wanting all my attention. But I have to say he has been so good with the girls. 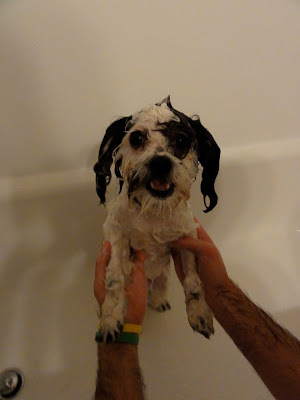 Meaning he puts up with a lot! They put him in the shopping cart, in the toy baby bed, in the wheelbarrow and he is constantly being carried around. He has a little warning growl he gives when he has had enough, but has never bitten the girls in anger. See the photo below, he gives me this look a lot... I think he is saying... "really, please help me". Here is to many more fun years with you little guy! Santa brought me this DVD for Christmas, I'm not one to own many movies for myself. We have a lot for the girls but I don't really watch many movies over and over. But this is one I really wanted to add to our little movie library. First I love stop motion movies and this one is done so well! The movement, lighting and styling of the characters is so wonderful. I can really appreciate the time it takes to make a movie like this. I would love to work on a movie like this. Meanwhile the girls and I will continue to make our homemade versions of stop motion movies. 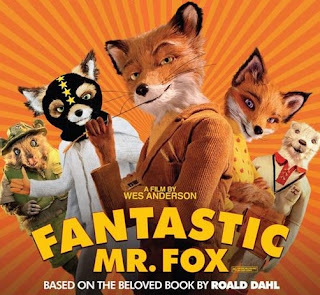 If you haven't watched Mr. Fox yet, it's totally worth it! 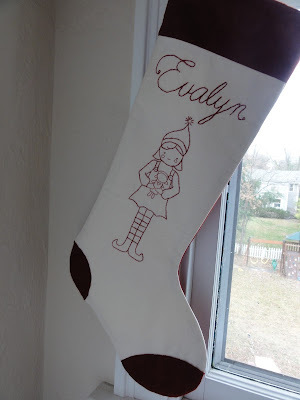 I made this stocking for my niece Evalyn, she celebrated her first Christmas this year. 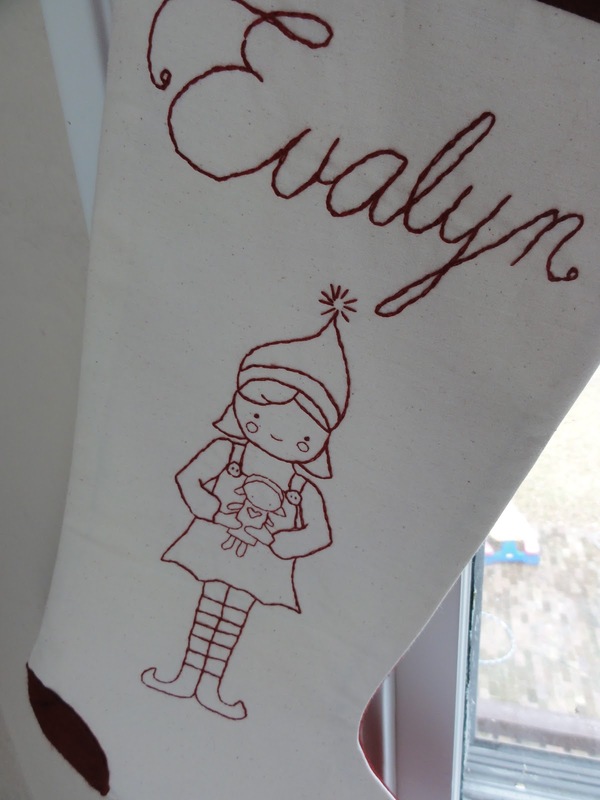 I had made matching stockings for Brent & Helen as a wedding gift, so I made Evalyn one to match theirs. 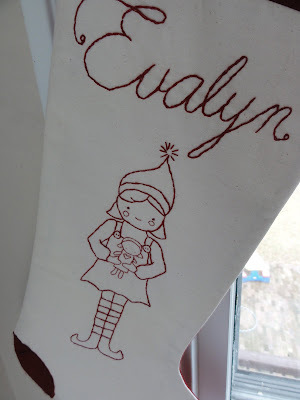 Here is the link to my 2009 post with a link the the elf pattern. taking our candy canes, we knew it was him!